Following Mutesa's funeral, his son Mwanga ascended to the throne of Uganda. Mwanga had found the Christian teachings interesting as a child--not interesting enough to convert but interesting enough to entertain long conversations with the missionaries--but found that indeed his crown weighed heavy upon his mind.He feared that the creeping colonization of foreign powers in Uganda that had started under Mutesa was significantly undermining the authority of the king in Uganda. When he spoke to Christians and heard reports of what they were doing and saying he became convinced that they represented a great challenge to the ambitions of the Ugandan state. At first, he tried to restrict the access of missionaries to the citizens but found this largely ineffective because so many of the Ugandans had claimed the Gospel for themselves and could disseminate it among themselves without the assistance of the missionaries. In other words, the spread of the Kingdom couldn't be stopped because it already rested in the hearts and minds of the people. 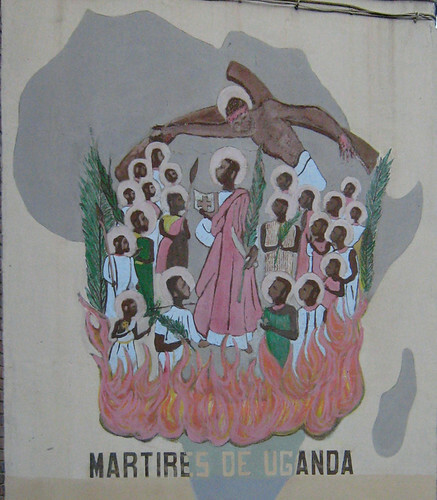 So, Mwanga did the only thing he thought would work: he endeavored to remove the Christians from Uganda by spilling their blood upon the ground.